Do you suffer from teeth clenching, grinding, bruxism or TMJ? Are you tired of waking up with headaches and a sore jaw and are looking for an inexpensive simple solution to relieve your pain? 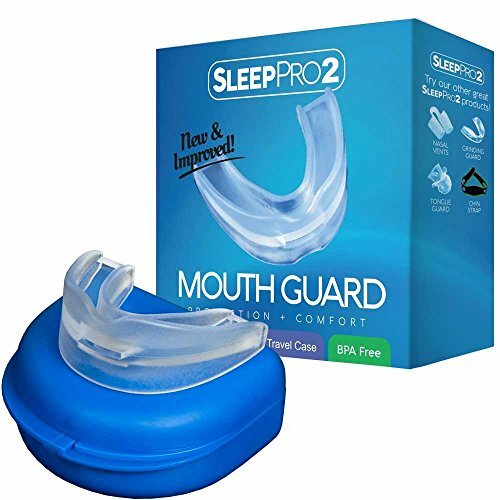 The SleepProTM custom mouth guard is the perfect solution for you! Our SleepProTM custom mouth guard is a moldable mouth guard for both upper and lower teeth designed to fit all teeth sizes, mouth shapes and alignments. We provide step by step instructions how to customize the guard to fit your teeth in just moments. Our high-quality silicone product is FDA-approved, BPA free and latex free material. This dentist approved mouthguard will effectively stop teeth grinding and prevent complications and damage to your oral health. See the difference with SleepProTM mouth guards and allow yourself a peaceful night's sleep once again! SATISFACTION GUARANTEED: 100% money-back guarantee. No questions asked! HIGHEST QUALITY - SleepProTM mouthpiece is made of FDA-approved, BPA free and latex free material. SLEEP WELL - Get instant relief from Bruxism. MONEY BACK GUARANTEE: You are Backed by Our 30 Days, No Hassle, No Questions Asked 100% Money Back Guarantee. Buy now RISK-FREE. If you have any questions about this product by SleeProTM, contact us by completing and submitting the form below. If you are looking for a specif part number, please include it with your message.